The premier gallery south of Dallas with works by many of the countries leading artists and custom framing by national known artist Robin Ingle. Visual Expressions is proud to provide collectors the finest in works by leading American artists around the world. 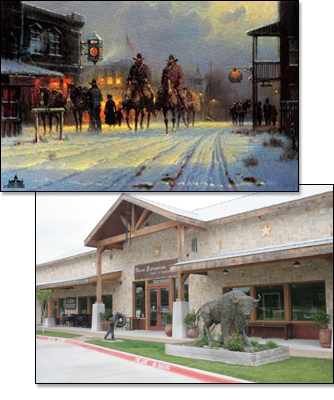 The gallery regularly features an outstanding collection of westerns, landscape, impressionism and wildlife paintings along with bronzes and many gift items. Represented artists include members of the Cowboys Artist of America, the National Academy of Design, the American Watercolor Society, Southwest Watercolor Society and the Prix de West. In addition to fine art on display, Visual Expressions Gallery specializes in location art of all types for collectors and interior designers. The Gallery also offers a very unique lease and lease purchase program. The custom framing done by Visual Expressions is truly second to none. With over 1500 frame mouldings and mat samples from the finest suppliers in the world, the choices are endless. Nationally recognized artist Robin Ingle is personally involved in all framing and design. With her help customers are assured a beautifully designed and absolutely perfect finished art piece. Repairs and appraisals are also done at the Gallery.